Communities Key To Fighting Opioid Crisis, Says HHS Secretary Tom Price : Shots - Health News Health and Human Services Secretary Tom Price is touring communities that have been hit hard by painkiller overdoses and heroin. He says, when it comes to opioid abuse, "We're losing as a nation." Health and Human Services Secretary Tom Price says "We're losing as a nation," when it comes to opioid abuse. On Wednesday, the White House announced it would appoint Massachusetts Gov. Charlie Baker, North Carolina Gov. Roy Cooper, former Rhode Island Rep. Patrick Kennedy and Harvard Medical School researcher Bertha Madras to the commission, which is headed by New Jersey Gov. Chris Christie. Now, the secretary of health and human services, Tom Price, is touring communities that have been hit especially hard by painkiller and heroin overdoses. 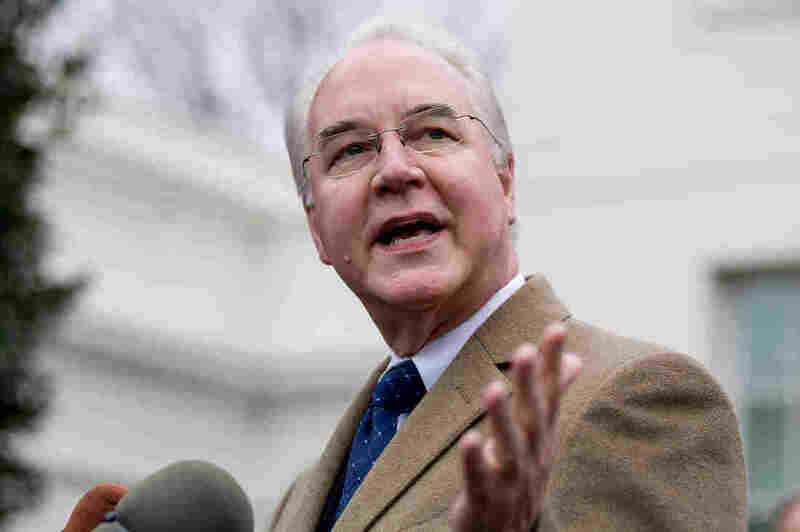 Price spoke to NPR's Rachel Martin shortly after visiting West Virginia. He talked about his agency's role in combating drug addiction, as well as the potential impact of the health care bill recently passed by House Republicans. The interview has been edited for length and clarity. On the administration's approach to opioid abuse in the U.S. The purpose of this tour is to punctuate the president's commitment to solving the opioid crisis. The numbers, as you know, were absolutely astounding: 52,000 overdose deaths in 2015, [and] 33,000 of those by opioid overdose. So what we're trying to do is to learn from folks on the ground. What are their best practices? What kinds of things are they doing that are working to solve this crisis? Well, this administration's commitment to this is unparalleled. There are hundreds of millions of dollars that are coming forth to fight the opioid crisis. Just two or three weeks ago we let, from the federal government, over about $485 million of grants to states. So resources are important but they're not everything, because we're still losing as a nation in this arena. The budget's a work in progress, so I don't know that any final decisions have been made [about funding], but the president's commitment to this challenge is unquestioned. Well, the health care proposal itself is an effort to try to save the health care system from the challenges that it currently has. Premiums are going up; deductibles are going up. So, it's failing the very people that it's supposed to help. The goal of the of the new health care legislation is to improve that system so that every single American has access to the kind of coverage that they want for themselves and for their families. No, what [the bill] does is stipulate where those decisions should be made. Should those decisions be made at the federal level or should they be made at the state level? And there's a mountain of evidence that demonstrates that, when those decisions are made at the state level, they're more responsive to the ... constituents.